British foreign policy after Brexit: An independent voice. An Interpretation of the European Economic Area Agreement, EEAA. At a time of alarming global instability, amid shocking terrorist attacks in Europe and mounting tensions between the USA and North Korea, a clear and focused foreign and defence policy is ever more critical. Now that UK’s departure from the EU is underway, what happens next? Against this unpredictable geopolitical backdrop, Britain’s position in the world needs to be recalibrated to take account of a range of new realities. Now is the time to move forward, to define a positive, outward looking, role in this post-Brexit world. 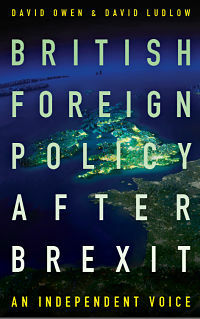 British Foreign Policy after Brexit examines what lies ahead, encompassing a diplomatic, security, development and trade agenda based on hard-headed realism. Former Foreign Secretary David Owen and former diplomat David Ludlow, who backed opposite sides in the referendum, together argue that Britain’s global role and influence can be enhanced, rather than diminished, post-Brexit. British Foreign Policy after Brexit by David Owen and David Ludlow is, perhaps surprisingly, a book written by two people from different generations who voted on opposite sides in the 2016 referendum. One a politician, the other a former diplomat, they both have significant business experience in world markets. The authors demonstrate how Britain’s global role and influence can be enhanced rather than diminished post-Brexit, with a diplomatic, security, development and trade agenda based on hard-headed realism, including a review of budgetary priorities. As a firmly European country, they see the UK as a key player with Germany and France in the wider Europe, and a leader in security issues threatening the continent’s stability. They do not regard the relationship with Moscow as inevitably confrontational, but believe strengthening NATO is essential and a top priority to contain Russia. In the wider world, a reinvigorated UK US relationship will be critical, but must accommodate differences in some core areas, e.g. in dealing with China. Furthermore, they see the UK’s new aircraft carrier at the heart of a UN Rapid Reaction Force drawn mainly from Commonwealth countries, including Australia, Canada, India and New Zealand, and supporting operations around the globe. "...the existing machinery that we could most easily adopt is to remain a contracting party to the European Economic Area agreement, as a non-EU contributing member." The world faces a very grave situation over what to do to contain the North Korea dictator.